Happy Hump Day! Today I am reviewing a book that will tear you to pieces. It is heart wrenching in its love and sadness. The rawness of this story fills all of the pages and will leave you feeling exhausted from the emotional roller coaster. 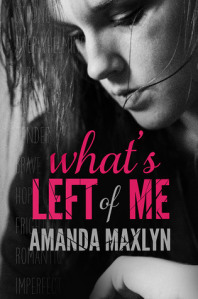 For my full review of Amanda Maxlyn’s What’s Left of Me keep reading after the book blurb. I hope all of you are having a great week.